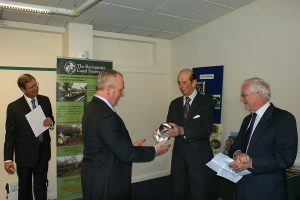 HRH The Duke of Kent presenting the QAVS Trophy to Mr Kevin Redway, long time Basingstoke Canal Society volunteer. Also in the photo, the Lord Lieutenant of Surrey, Mr Michael More-Molyneux (left) and Mr Philip Riley, Chairman of the Basingstoke Canal Society (right). HRH The Duke of Kent today (13th November 2018) presented the award to the Basingstoke Canal Society in recognition of the work done by volunteers over 50 years in helping restore and maintain the Basingstoke Canal for the benefit of the local community and visitors alike. This unique UK national honour, equivalent to an MBE for voluntary groups, was created by Her Majesty to mark the golden Jubilee in 2002 and to recognise the outstanding contributions made to local communities by those groups. It was particularly appropriate that The Duke attended this event since he formally opened the Canal when restoration was completed in 1991. The presentation took place at the Canal Centre at Mytchett, Surrey with around 60 Society volunteers representing the many hundreds who have helped over the years. The Society was founded in 1966 following the publication of a letter in the local press suggesting that something should be done about then derelict Canal. A volunteer group was formed and they persuaded Surrey and Hampshire County Councils to support the full restoration of the Canal as a navigable waterway with the promise of voluntary labour. This involved extensive recruiting of volunteers and then the mammoth task included clearing the towpath along 32 miles of Canal, an 18 year dredging programme, restoring 29 locks and reinforcing embankments. Restoration was completed some 25 years later, and the Society celebrated its 50th anniversary in 2016. The Award also recognises the Society’s continued work to support the Canal, including the operation of two trip boats which over the years have brought in about £800,000, monies which are used to fund maintenance and new projects. Accompanying HRH The Duke of Kent was the Lord Lieutenant of Surrey, Michael More-Molyneux. The Duke was introduced by the Chairman of the Canal Society, Philip Riley, to some of the 200 current volunteers, including the work parties who do some of the building project work, the crew of the trip boats and volunteers who support the sales and promotional work. He also had the opportunity to go aboard the John Pinkerton II 50-passenger trip boat, which was moored at the Canal Centre. There was no time to go for a trip but it gave HRH a chance to compare the new boat with the original “John Pinkerton” which took him for a trip in 1991. He then presented the glass trophy to Kevin Redway, one of the Society’s longest serving volunteers, who recalled that he had fallen in the canal for the first time at the age of 3. In accepting the QAVS award, Mr Riley explained how when restoration of the Canal began, no-one knew how to do it, how long it would take or how much it would cost, but the early volunteers nevertheless all shared a passionate commitment to see the job completed. He said that having undertaken this huge effort, the Society membership have great affection for the Canal and wish to see it prosper and develop. On behalf of the Society, he expressed his sincere thanks for the award. Click here to see photos and a video of the event. The Surrey and Hampshire Canal Society was founded in 1966 to campaign for the Basingstoke Canal to be taken into public ownership and restored to a navigable standard. This campaign was successful and the canal was acquired by the Surrey and Hampshire County Councils in the early 1970s. Following its acquisition, the Society entered into a partnership with the County Councils to restore the derelict canal. The Society organised volunteer working parties which undertook a wide range of tasks. These included dredging 12 miles of canal in Hampshire, rebuilding 28 locks in Surrey, rebuilding bridges and weirs and clearing the towpath and offside banks. The work was completed in 1991 and the canal re-opened from the River Wey Navigation in Surrey to Greywell in Hampshire that year. The Surrey & Hampshire Canal Society sees itself today as the guardian of the Basingstoke Canal. The Society decided to re-name itself as the Basingstoke Canal Society last year to clarify its interests. 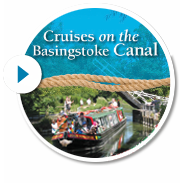 Its original name was the result of a desire to avoid confusion with the New Basingstoke Canal Company that it was in conflict with in the 1960s over the Company’s intention to close the canal. Happily, the Society is on much better terms with the current owners, the Surrey and Hampshire County Councils, and both share a common aim for the future of the canal as a navigation and much appreciated local amenity.